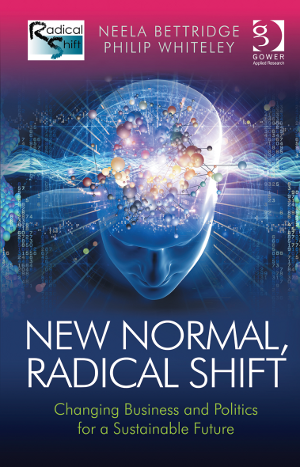 New Normal, Radical Shift: Changing Business and Politics for a Sustainable Future, is published April 2013 in the UK and USA by Gower Publishing http://www.gowerpublishing.com. A one-page ‘mini-manifesto’, summarizing six key principles from the book, is also available. Following the banking crisis and amid increasing environmental pressures, it is clear that the dominant business model in the west is unfit for purpose, and that the dash for short-term growth at any cost has led to economic ruptures and, in some cases, ruin. There are many books that demonstrate the benefits of enlightened leadership, engaged employees and environmental protection. New Normal, Radical Shift is different, however. As well as charting the evidence that demonstrates the effectiveness of strong leadership, it questions the habits that undermine good practice. The authors, Neela Bettridge and Philip Whiteley, have used their experience as, respectively, executive coach and journalist, to explore the beliefs that have encouraged many to believe the opposite: that exploiting the workers and the environment maximizes corporate profits. They chronicle the damage that such cynical beliefs have brought, and discuss their origins in political theories, forming the momentous conclusion that the ‘left-right’ way of viewing economics and society is profoundly flawed. New Normal, Radical Shift calls for a fundamental renewal of the business model, and a much higher priority for governance and sustainability, including environmental sustainability, in political circles. The authors report how the organisations that have hit crisis – many western banks, and those firms brought down by accountancy scandals or reckless merger activity – followed the cynical fads that had their roots in political ideology. By contrast, many principled organisations that refused the dash for short-term or speculative profits have proved to be more profitable as well as more ethical and sustainable. The book sets out an alternative business model that is at once more practical and more positive. It features case studies with leading employers that have delivered for all their stakeholders. These include: Westpac, ISS, the Prospect trade union, and Marks & Spencer. o Neela Bettridge is an executive coach and sustainability adviser. She uses the principles of ‘conscious leadership’, in which the executive understands the needs of all stakeholders, internal and external. She is also an experienced adviser on environmental sustainability, and is a co-founder of the international consultancy Article 13 (http://www.article13.com). o Philip Whiteley is an author and journalist with 15 years’ experience in the field of leadership and organizational development. In his work he argues for a fundamental renewal of the business model towards an evidence-based approach based on the recognition that organisations consist of people not inanimate ‘assets’. Philip Whiteley may be contacted on: phil(at)whiteleywords(dot)com or +44(0)7951 601575. New Normal, Radical ShiftNew Normal, Radical Shift: Changing Business and Politics for a Sustainable Future, is published April 2013 in the UK and USA by Gower Publishing. www.gowerpublishing.com.